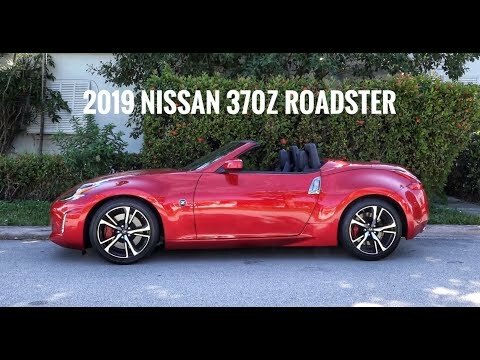 2019 Nissan 370Z Roadster, red and HOT ! What better way to defy limitations than getting a Nissan 370Z Roadster, you won’t find many barriers to reach your destination, just get there, and others will follow. 332 is the number of horses this roadster hides inside its engine, a perfect number, less would make it underpowered, more would be just too much power. Since its inception, the Z line of Nissan coupes have consistently been an example of how a sports coupe should look like, an iconic stance with performance to match. But inside the story is very different, tons of spaceship looking shapes, gauges and screens makes the interior look overly busy, what happened to simple clean design? If you enjoy being surrounded by the last letter of the alphabet, the 370Z is your car, a big proud capital Z is everywhere, so you never forget what car you’re driving. There is a good amount of tech to indulge yourself, Nissan’s excellent hard drive navigation system is available as well as a rich sounding dual subwoofer Bose sound system. While the rest of the world is buying every possible variation of an SUV, it is good to know that we can still count on the good’ol 370Z to escape to some twisty road.